This article is about the European Megalithic stone circles. For other uses, see Stone circle (disambiguation). A stone circle is a circular alignment of standing stones. They are commonly found across Northern Europe and Great Britain and typically date from the Late Neolithic and Early Bronze Age eras, with most concentrations appearing from 3000 BC. The best known examples include those at the henge monument at Avebury, the Rollright Stones and elements within the ring of standing stones at Stonehenge. Ancient stone circles appear throughout Europe with many appearing in the Pyrenees, on the Causse de Blandas in southern France in the Cevennes, in the Alps, and Bulgaria. 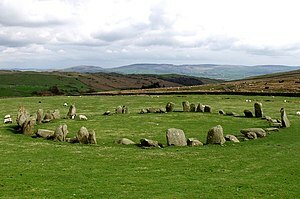 Stone circles are usually grouped in terms of the shape and size of the stones, the span of their radius and their population within the local area. Although many theories have been advance to explain their use, usually around providing a setting for ceremony or ritual, there is no consensus among archaeologists as to their intended function. Their construction often involved considerable communal effort, including specialist tasks such as planning, quarrying, transportation, laying the foundation trenches, and final construction. There is growing evidence that megalithic constructions began as early as 5000 BCE in northwestern France, and that the custom and techniques spread via sea routes throughout Europe and the Mediterranean region from there. The Carnac Stones in France are estimated to have been built around 4500 BCE and many of the formations include megalithic stone circles. The earliest stone circles in England were erected 2500-3000 BCE during the Middle Neolithic (c. 3700–2500 BCE). Around that time stone circles began to appear in coastal and lowland areas towards the north of the United Kingdom. The Langdale axe industry in the Lake District appears to have been an important early centre for circle building, perhaps because of its economic power. Many had closely set stones, perhaps similar to the earth banks of henges, others were made from unfounded boulders rather than standing stones. Recent research shows that two oldest stone circles in Britain (Stenness and Callanish)were constructed to align with solar and lunar positions. Some sites do not contain evidence of human dwelling. This suggests that stone circles were constructed for ceremonies. The variety of the stones excludes the possibility that they had astronomical observation purposes of any precision. Sometimes a stone circle is found in association with a burial pit or burial chamber, but the great majority of these monuments have no such association. Recumbent stone circles are a variation containing a single large stone placed on its side. The stones are often ordered by height, with the tallest being the portals, with gradually reducing heights around each side of the circle, down to the recumbent stone, which is the lowest. The type is found throughout the British Isles and Brittany, with 71 examples in Scotland, and at least 20 in south west Ireland, including Drombeg stone circle near Rosscarbery, Co. Cork. Scottish recumbent circles are usually flanked by the two largest of the standing stones immediately on either side. These are known as 'flankers'. The stones are commonly graded in height with the lowest stones being diametrically opposite to the tall flankers. 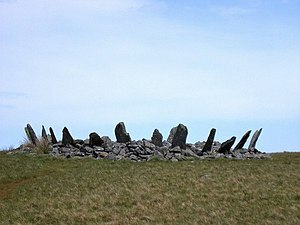 It is fairly common for the circle to contain a ring cairn and cremation remains. Irish recumbent stone circles are found in Cork and Kerry. There are no tall flanking stones on either side of the recumbent stone. Instead, there are two tall stones at the side of the circle opposite the recumbent stone. These are known as 'portals' as they form an entrance into the circle. Often the portals are turned so that their flat sides face each other, rather than facing into the centre of the circle. A concentric stone circle is a type of prehistoric monument consisting of a circular or oval arrangement of two or more stone circles set within one another. They were in use from the late Neolithic to the end of the early Bronze Age, and are found in England and Scotland. Cobble pavements have been found in the centre of many examples. Connected features at some sites include central mounds, outlying standing stones, and avenues or circular banks on which the stones are set. Alternatively, they may be replicas of earlier timber circles rebuilt in stone, especially the examples in Wessex. A funerary purpose is thought likely, especially by Burl who sees sites in Cumbria as being analogous to the kerbs that surround some chamber tombs. Burials have been found at all excavated concentric stone circles: both inhumations and cremations, with the burnt remains either within an urn or placed directly in the earth. Megalithic monuments are found in especially great number on the European Atlantic fringe and in the British Isles. 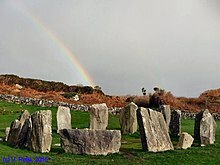 Although widely distributed across the island, the two main concentrations of stone circles in Ireland are in the Cork/Kerry area and in mid-Ulster. The latter typically consist of larger amount of small stones, usually 03.m high, are often found in upland areas, and on sites that also contain a stone alignment. The Cork/Kerry circles tend to be more irregular in shape, and with larger, but fewer and more widely spaced, orthostats around the axial stone. Examples can be found throughout much of Europe from the Black Sea to Brittany in France. Locations in France include several in Brittany (two on the island of Er Lannic and two more suggested at Carnac), several in the south of France on the Causse de Blandas in the Cevennes, in the Pyrenees and in the Alps (e.g. the Petit Saint Bernard). One notable stone circle is in the Italian Alps. As early as 1579 CE, scholars in Germany described large erect stone circles near Ballenstedt. There are several examples in the Alentejo region of Portugal, the oldest and most complete being the Almendres Cromlech, near the regional capital of Évora and within its municipality. Many others have left behind them only the central Anta (as they are known in the Alentejo) sometimes as an altar but more often as a central burial structure, originally surrounded by megaliths that have only sparsely survived erosion and human activities. In 2001 a stone circle (Beglik Tash) was discovered in Bulgaria near the Black Sea. These circles are also known as harrespil in the Basque country, where villagers call them mairu-baratz or jentil-baratz that means "pagan garden (cemetery)", referring to mythological giants of the pre-Christian era. No example has survived in a good state of preservation but like the Alentejo, the Basque Country is dotted with eroded and vandalized examples of many such structures. Ancient stone circles are found throughout the Horn of Africa. Booco in northeastern Somalia contains a number of such old structures. Small stone circles here surround two enclosed platform monuments, which are set together. The circles of stone are believed to mark associated graves. At Emba Derho in the Ethiopian and Eritrean highlands, two kinds of megalithic circles are found. The first type consists of single stone circles, whereas the second type comprises an inner circle enclosed within a larger circle (i.e. double stone circles). ^ a b Paulsson, B. Schulz (February 26, 2019). "Radiocarbon dates and Bayesian modeling support maritime diffusion model for megaliths in Europe". PNAS. 116 (9): 3460-3465. doi:10.1073/pnas.1813268116. Retrieved 23 March 2019. ^ Annick Jacq. "Carnac". Bretagne-celtic.com. Archived from the original on 2012-04-01. Retrieved 2009-05-05. ^ Burl, Aubrey (1995). A Guide to the Stone Circles of Britain, Ireland and Brittany. Yale University Press. ^ Welfare, Adam (2011). Great Crowns of Stone: The Recumbent Stone Circles of Scotland (PDF). Edinburgh: Royal Commission on the Ancient and Historical Monuments of Scotland. p. 271. ^ Aubrey Burl. "The Megalith Map". Archived from the original on 2006-09-28. Retrieved 2006-09-22. ^ Burl, Aubrey (2000). The Stone Circles of Britain, Ireland and Brittany. New Haven: Yale University Press. p. 5. ^ Jan Albert Bakker (2010). Megalithic Research in the Netherlands, 1547-1911: From "giant's Beds" and "pillars of Hercules" to Accurate Investigations. Sidestone Press. p. 47. ISBN 978-90-8890-034-1. ^ Hussein Mohamed Adam (1992). Charles Lee Geshekter (ed.). The Proceedings of the First International Congress of Somali Studies – Somali Studies International Association. Scholars Press. pp. 37, 40. ISBN 0891306587. Retrieved 9 November 2014. ^ Institut für Afrikanistik und Aẗhiopistik – Universität Hamburg (2004). Aethiopica: International Journal of Ethiopian Studies. 7–8. Harrassowitz Verlag. p. 27. Retrieved 1 January 2015. Burl, Aubrey (2000). The Stone Circles of Britain, Ireland and Brittany. New Haven and London: Yale University Press. ISBN 978-0-300-08347-7. Bradley, Richard (1998). The Significance of Monuments: On the Shaping of Human Experience in Neolithic and Bronze Age Europe. London: Routledge. ISBN 978-0-415-15204-4. Childe, V. Gordon (1947). Prehistoric Communities of the British Isles (second edition). Glasgow and London: Gilmour & Dean Ltd.
Murphy, Cornelius (1997). The Prehistoric Archaeology of the Beara Peninsula, Co. Cork. Department of Archaeology. University College Cork. Thomas, Julian (1999). Understanding the Neolithic. London: Routledge. ISBN 978-0-415-20767-6. Joanne Parker, ed. (2009). Written On Stone: The Cultural Reception of British Prehistoric Monuments. Cambridge Scholars. ISBN 1-4438-1338-9. Ronald E. Hicks (1981). "Henges and stone circles, ritual and archaeoastronomy: archaeological research in Ireland and Great Britain". Wikimedia Commons has media related to Stone circles. Wikisource has the text of The New Student's Reference Work article "Stone-Circles". Interactive map of megalithic monuments in Europe.